I recently had the pleasure of interviewing Laura Hughes, the creative force behind Billy Grrrl. Her Etsy shop is full of fun, colorful modern needlepoint and DIY needlepoint kits. She also offers Polaroid photography, Rorschach art, landscape photography, and women's winter hats. 1. Please give us a short background description of yourself. I’m originally from Cleveland Ohio and live in New York City. When I’m not creating (this is now what I do full time) I am working out (yoga, pilates, biking), visiting galleries / museums, reading, and exploring NYC while walking my dog Billy (a 16 year old Jack Russell Mix). She’s cute and feisty which is why the name is Billy Grrrl. 2. How did you get started crafting? I’ve been crafting since I was a kid. I never thought I was good at it, but I loved working with my hands. I went through periods when I wasn’t crafting, but I feel more balanced when I do craft - it’s my meditation. 3. What is your specialty & why did you choose it? Needlepoint is my specialty though I also like cross stitch, rug hooking and crochet. I don’t know why I chose needlepoint, it just felt right and comfortable. It was a struggle to learn at first, but once I found my rhythm I never turned back. I really enjoy working with small canvases since I can travel with them and finish them easily. This is why I design small kits. People would ask me what I was doing and where they could get one. I am inspired daily by different things. I love the colors and patterns of the 60’s and 70’s (textile design, furniture, clothes, wallpaper, etc). Discovering new artists is very inspiring which is why I’ve kept a blog since 2008. Nature - especially animals and insects. The characters I design are inspired by this. When I’m stitching I listen to music or podcasts. I get inspired by other people’s stories. 5. What does handmade mean to you? Handmade means everything to me. I am so attracted to objects that have been made by hand. This is especially true in needlework. I know there are great machine embroidered items out there, but nothing beats the real deal. It’s the difference of wearing a really great handmade sweater vs. a machine-made one. There is beauty in the imperfections you get with handmade. There is no way a machine can duplicate this. I love watching videos of artisans doing handwork on couture clothing, arm knitting, or this link from the British company Mulberry. The women in this video are fantastic! 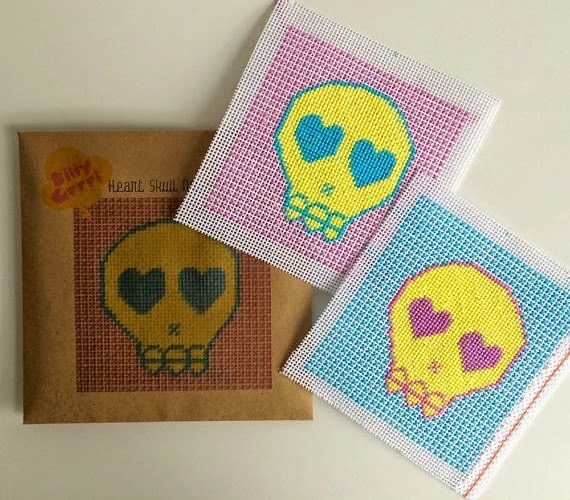 PRIZE: One lucky winner will receive a Skull Embroidery Beginner Needlepoint Kit (pictured) from Billy Grrrl. TO ENTER: Like Billy Grrrl on Facebook and leave a comment noting you have done so. ADDITIONAL ENTRY: Leave a comment noting why you would love to win this fabulous kit! Giveaway ends at 6pm CST, Tuesday, May 5th, 2015. I would love to win this so I can teach my daughter needle point. She has not tried it yet.